You are here: Home / FREEbies / FREE 11×14 Photo Canvas! Woo hoo! We have a fantastic FREEbie for all you shutterbugs! 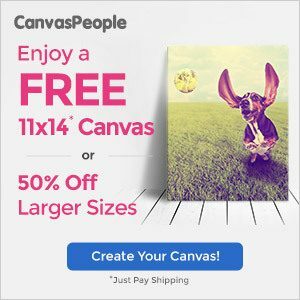 Right now, you can grab a FREE 11×14 Photo Canvas from Canvas People! If you want a larger size, you can forgo your FREEbie and get 50% off larger canvases instead! You will pay shipping. These make GREAT gifts! I have a couple of canvases from Canvas People, and I LOVE them! The quality is excellent, and they are hanging in my living room where we can admire them every day!